It's much better to end it now in the early stages before one of you develops feelings, because you or the person you're dating will end up getting very hurt if you don't. If you only went on a few dates, then sending a thoughtful text to explain your feelings will be enough to let the person know that you don't want to continue dating them. Let them know that you really enjoyed spending time with them but you feel like you're just friends and can't see it progressing into a relationship. Be honest with the person and be open about your reasons for wanting to end it. You don't have to force yourself into a relationship with anyone an if it's not working out then don't worry! Just be polite and respectful and end it on good terms. If you had different values or there was no spark, just let them know that. Don't give them false hope by saying things like, 'maybe we'll see each other again.' It's better to be brutally honest than to lead them on to thinking that they may have a chance with you again. 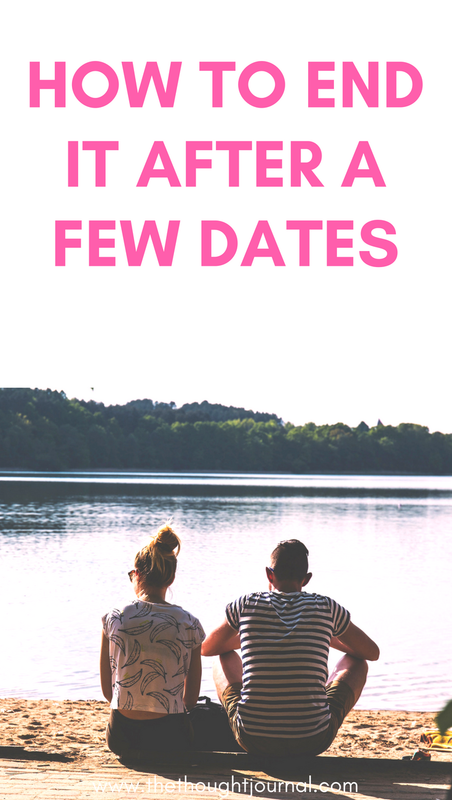 If you've been dating for more than a few weeks then a face to face conversation or 'breakup' may be more suitable. If you think the person you're dating has developed feelings for you and there's a connection there, then it's only fair if you explain to them in person that it's not working out. Don't take the easy way out by sending a text if you've been seeing each other for quite a while. Although it's hard for both people, arrange to meet the other person and have a chat to explain exactly how you're feeling and your reasons for not wanting to see them anymore. Help them to understand why you want to end it and give them the respect of a proper explanation, they have given a lot of their time to you after all. Usually people who break up and agree to stay friends don't work out, but if after a few dates you realise that you're only just friends, then maybe it's good to stay friends! Although it hasn't worked out for you both as a couple, maybe you've found a great friend in each other and there's no reason why you can't continue the relationship on a friendship level. Just make sure there's no feelings more than friendship on both sides, to avoid getting hurt. However it ends, let them down easily and be thankful for the chance to meet someone new and gain experience in the dating world. Everyone we meet has an impact on our lives and at least you've been able to discover someone new who will lead you to discovering who is really meant for you. Whatever you do, don't ghost someone and don't cut them out of your life with no explanation. Everyone deserves to be loved and respected and remember to show kindness always. I wish more people did this! It can be scary for sure, but I think nothing feels worse than being led on.